I started another recent post on accuracy on Medium Bore Rifles (Poor accuracy - What's wrong) and after reading the responces decided to try the 140-grain Berger VLD Hunting bullet which would stabilize in my 7 MM STW with an 11" twist and which was suposed to expand or even fragment at long ranges (600 yds+). The 140-grain Nosler BT's which I had previously used did not expand well at long range. A few years ago I did a wacky comparison test between two 6MM bullets, the 70-grain Nosler BT Varmint and the 105-grain Berger VLD Hunting. With a pait of Dykes wire cutters I could cut the Berger bullet in two but I could not cut the Nosler bullet in two. 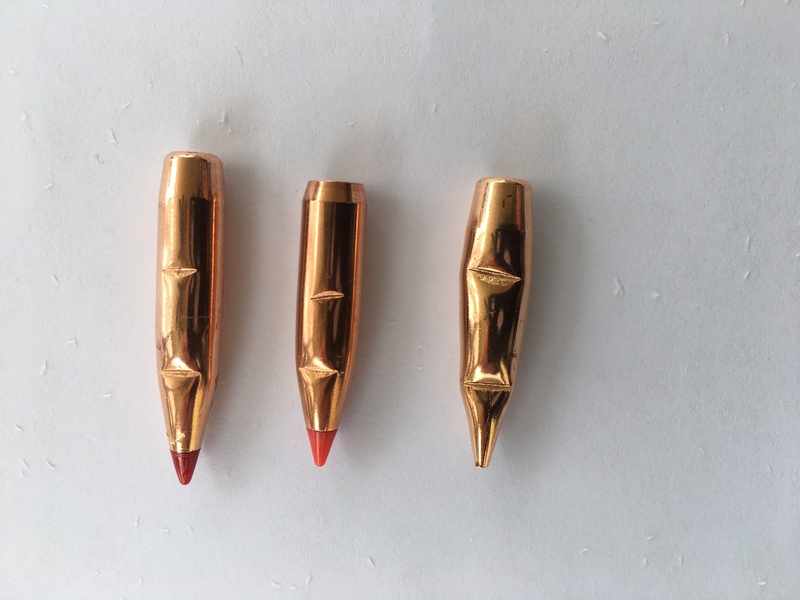 I tried the same thing with three 7 MM bullets, the 162-grain Hornaday ELD-X (on the right), the 140-grain Nosler Balistic Tip (in the middle) and the 140-grain Berger VLD Hunting bullet (on the left). I could not cut any of these in two but got different results on each. The Nosler and the Hornaday were about the same in the middle but the Hornaday had a deeper cut in the nose area. The cuts on the Berger were deepest both in the middle and the nose area. That is telling me that the Hornaday bullet will probably expand more than the Nosler at long range but penetrate more than the Berger at long range. For my use (doe deer and antelope) the Berger will probably work best at long range. Whoops, it looks like the photo may have turned upside down so let's say the Nosler bullet is in the middle. The Hornaday bullet is the longest one. And the berger is the one without a plastic tip. What I have found in my 7mm mag and 7mm08 as well as the 7x57 the 139 grain in Hornaday works best for me and my guns I had pretty good luck with the 120 sierra but they were shot using H4895 and with Hogdon reduced load chart. odd results. Ive shot MANY deer at long range not 600 but out to 500 with the 7 mag and my 7stw using 140 and 150 bts and have never seen lack of expansion. If anything its just the opposite. To me they've even been more explosive then sierras and the only bullet (hunting bullet) ive seem more explosive are Hornaday ssts. How many deer have you shot with bts to come to this conclusion. I like to shoot at least 10 deer with a bullet before I pass final judgement on it. Theres to many variables like if you hit bone or not, how big the bones were that were hit ect. I still use the 140 bt in my 7rem mag because ive found no other bullet that dumps deer in there tracks in that gun then that bullet. I started my 7stw hunting using the 140 bt because of my luck in the 7 rem mag with it. It continued to dump deer but it just tore them up to much. I switched to a 150 bt and found it not only did a bit less damage but out past 400 yards actually shot flatter. I don't set up so that all my shots are at extreme ranges though. A bullet that has to expand if I get a shot at 500 yards still has to not cut a deer in half if one comes out at 200 yards. Ive shot deer with MANY different bullets at what I consider long range (and that's 300 yards or more) Factoring in terminal performance and accuracy the two that stand out as the best across the board in about all of my guns are BT's and sierra pro hunters. Spear hot cores and Hornady interlocks have done well too but when its stretched past 400 yards expansion in interlocks can get iffy. If I was pinned down and was told that I could only use one bullet for ALL of my whitetail hunting it would probably be the bt's. Yup they much up a bit more meat then most but I try not to shoot them in the meat and no bullet has given me more dead right there kills then ballistic tips. There usually the easiest bullets to find accuracy with too. In my experience if a gun wont shoot bt's or sierras well its just not going to shoot well. At least with not hundreds of dollars worth of load development and many hours of bench time. to be honest I haven't given bonded bullets a try. I guess ive never seen a need to fix something that isn't broke. I have shot quite a few deer with partitions and think there a great choice but not really needed on deer. I also spent an entire season along with my buddy using barnes x bullets exclusively. We spent more time tracking deer that year then all the other 10 years or so of crop damage shooting we have done. You couldn't pay me to use another one. What ive found for the most part on the internet are guys that love the barnes bullets are the guys that shot maybe two or three deer with them. Use them enough and youll learn to dislike them like I do. that is unless your idea of fun is tracking deer and dragging them a mile out of the swamp. lloyd smale - I like your response. It got me to thinking. The 140 Nosler BT was probably only part of the cause of the results I got at long range with my 7 MM STW. The other part, maybe a larger part is the twist rate of my gun, 1-in-11. I should have thought about this earlier since I have a lot of experience on twist rates in 7 MM’s. First, Nosler shows load data for most 7 MM cartridges using test barrels with a 1-in-9 twist. Using the equation for centrifugal force one can calculate that a 1-in-9 twist compared to a 1-in-11 twist for a bullet at the same velocity would generate almost 50 percent more centrifugal force in the bullet. If one has read about bullets blowing up in the air on the way to the target, they would probably agree that twist rate would have an effect on bullet expansion. Also, I have read that the spin of a bullet slows does not slow down as quickly as its velocity as it goes down range. I bought a 7 MM Weatherby magnum when in high school over 50 years ago and had it re-barreled three times since then. The factory barrel was had a 1-in-12 twist and I shot quite a few coyotes with it. It generally produced exit holes of 1-1/2 inches on coyotes. A classmate told me how his father’s .30-06 made 3 to 4-inch exit holes on coyotes. I thought that was a bunch of bull since my 7 MM was a much higher velocity rifle. Then just after college when the factory barrel went bad, I had it re-barreled with a barrel with a 1-in-10 twist. The first coyote I shot with it had a 4-inch exit hole and this was with a 139-grain Hornaday bullet which was supposed to be a game bullet, not a varmint bullet. Subsequent coyotes with that barrel also had large exit holes. Then when that barrel eroded, I had it re-placed with a barrel with a 1-in-9 twist and later had it re-barreled with a barrel with a 1-in-12 twist chambered for 7 MM STW. I wanted a rifle which would shoot as flat as possible for 400 yards. It shot 120-grain Hornaday hollow point varmint bullets at 3,650 fps. Again, it produced smaller exit holes on coyotes. In addition, I shot 17 antelope with it and mostly from 300 to 400 yards and that bullet went completely through the antelope every time generally making an exit hole of about 1-1/2 inches. Anyway, I am thinking that bullet manufactures use a standard twist rifle when designing and testing bullets and in my 7 MM rifle with slower twists their bullets don’t behave like they were designed to behave. The old 7 MM rifle was given to my son after my current 7 MM STW was put together with the 1-in-11 twist barrel. I had this rifle put together because the old rifle would not shoot Ballistic Tips accurately and it appeared, they were much superior to the old 120-grain Hornaday hollow points which shot well in the old gun. The new gun would not shoot the 120-gr BT’s like I had hoped but it does shoot the 140-gr BT’s well. I never noticed large exit holes on quite a few coyotes shot with it nor on the 500-yard antelope I got with it that ran 100 yards after a good hit through the lungs. Neither did the two deer I got with it at around 500 yards have large exit holes and the deer I got at almost 600 yards only had a very small exit hole. My conclusion is that if the fragile 140-grain Berger VLD hunting bullets will not shoot accurately in it (for shooting to 600 yards or more), I will have to have it re-barreled with a faster twist barrel. Heavy long range bullets are not be stable from the current slow-twist barrel at low temperatures and most lighter bullets (except the Berger) will probably not expand well at long range with it because of the slow twist. I like the NBT in .243 and 25-06 because of the DRT results I've had on deer and pigs. IMO better to lose a pound or two of meat than chance a runoff. I don't and probably won't have Lloyd's deer killing experience but I know what works for me. Premium bullets on deer? Not me, not necessary. Are you using the Boat tail or flat base? I love the Hornady 120 grain SPTs in my 7MM-08. I have killed everything from coyote to deer to antelope with them. I think anything that Jack 'O said about the 270 Winchester and 130 grain bullets could be said about the Little 7MM and 120's. A few years back east central Iowa saw a lot of coyotes with the mange. For about 3 years in a row I shot a lot of coyotes with a Winchester Shadow 7mm WSM with 100 grain Sierras on top of 70 grains of H4350. That load ran 3650 with the first batch that I loaded. I remember shooting one mangey coyote at 100 yards running straight away. I hit him right where the tail hooked on and he did a cart wheel. The whole back half of that coyote was blown up.......and it was fun! I also took that gun to the Rose Bud Indian Reservation on a late summer prairie dog hunt. I used my 223 or 243 for the most part but shot enough rounds through the 7mm WSM to have a very sore shoulder. In three years and 1,400 rounds later of nothing but those 100 grainers in that WSM the throat was toast and the barrel eroded. It still shot 1&1/2 inch groups but the there were now pressure signs showing from the primer flowing back around the firing pin and the velocity through a chronograph was almost 200 fps less than the original batch. More pressure and less velocity at the same time means time for a new barrel. I have to admit that this gun was a knock around gun and didn't get the most judicial care. I ended up sending it to JES and had it rebored to 375 WSM.